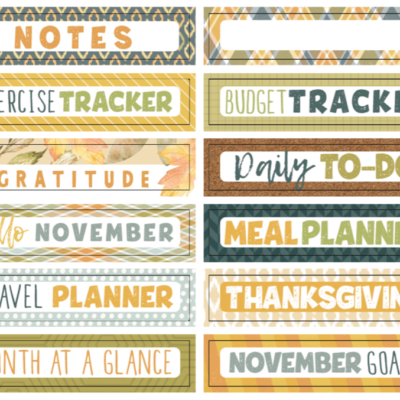 Does it feel overwhelming sometimes to set up your New Month? 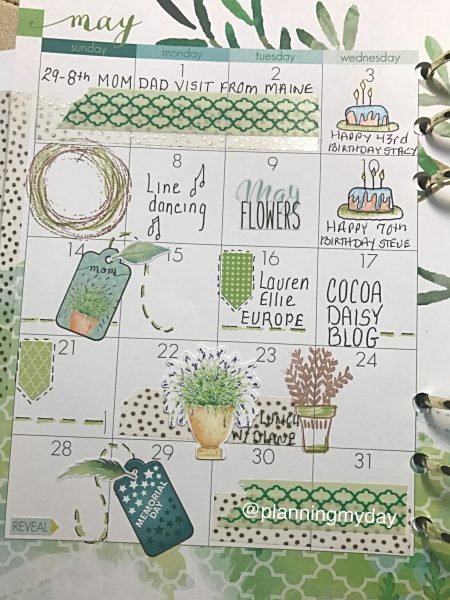 Hello friends and welcome to the Cocoa Daisy blog, so great to have you stop by for a bit. 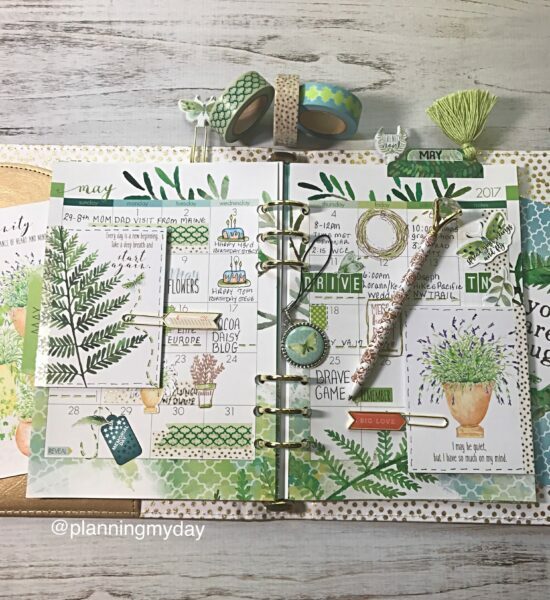 We always hope you’re inspired by what you read, and that you can take an idea back,… to your own craft room or planner desk! 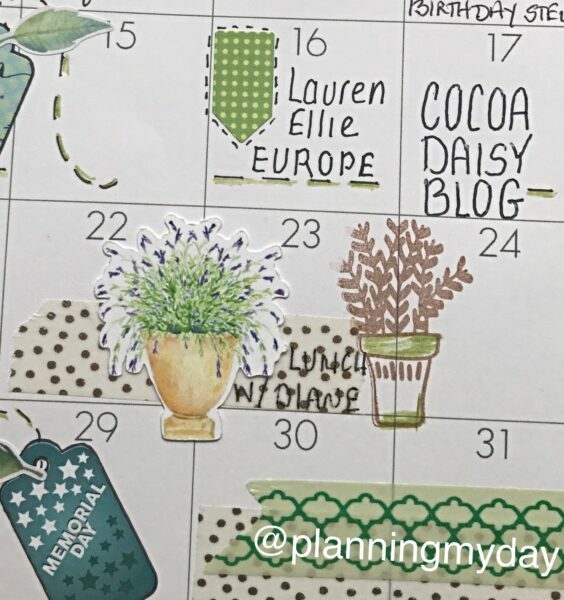 Today I’m going to share with you the actual steps I take in setting up each new month in my A5 Cocoa Daisy planner. So take a quick minute and go grab your favorite cup of coffee and come back to sit with me for a bit! 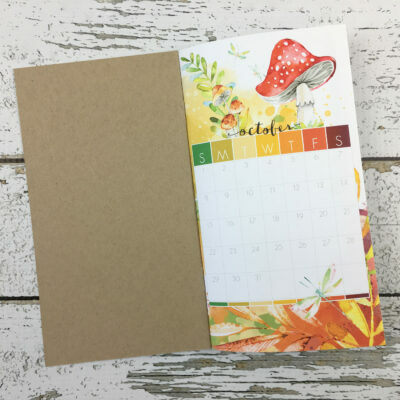 Now…..I don’t know about you but a blank page can often times feel quite overwhelming, and so for me, having steps to follow each month, makes setting it up so much more enjoyable, especially as it so often happens….. … Life happens!…. can you relate? LOL! Let’s get started, shall we? 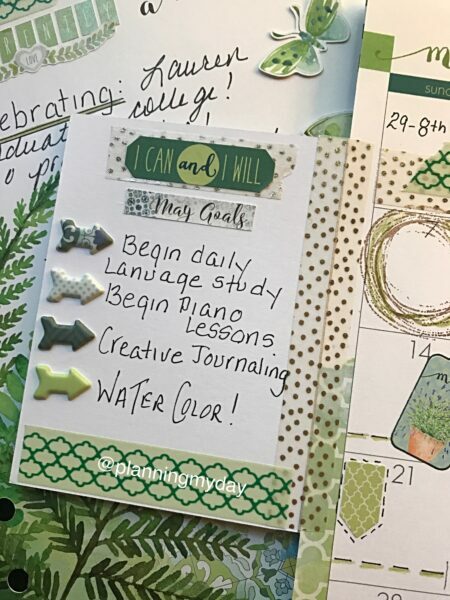 First thing I do is gather my supplies, choosing my coordinating Washi, Colored Pencils, Pens, and Stamp “ink”, along with Stickers, Ephemera and Cards! 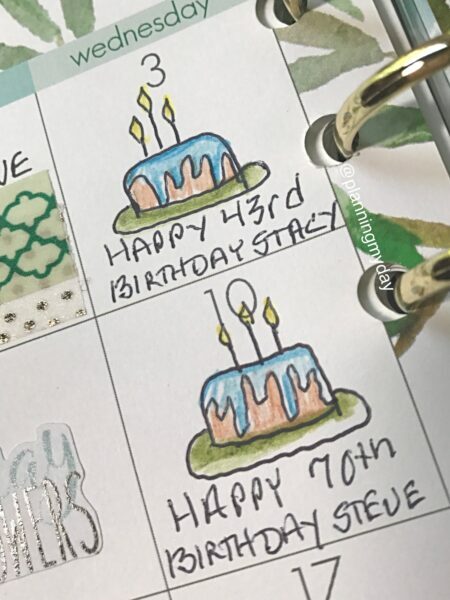 1..I draw simple Birthday cakes to mark the birthday Celebrations of the month. I like to log their age, so I’m less apt to miss milestones! 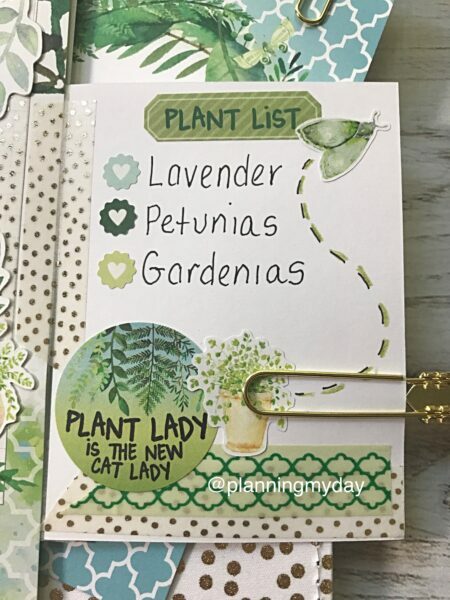 Just had a great idea from Mary Kay; I now also make a list of “Cards to Send” for the month with a place to log when each was mailed! 2. I note all special Holidays,using decorative stickers or alpha’s letters! 6. 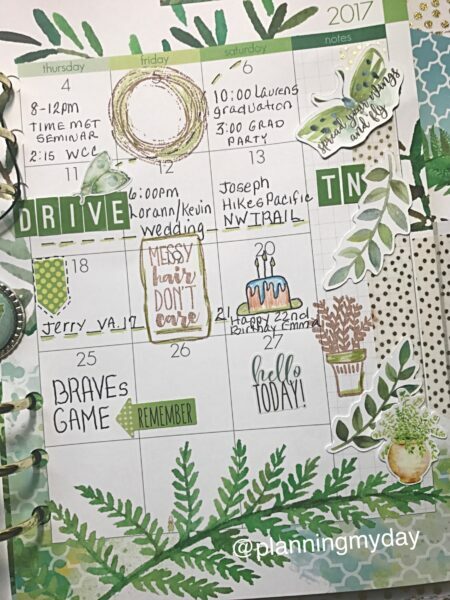 I love decorating the side-bar: here I often like to create a design that is cascading down the side, You can visit my https://www.instagram.com/planningmyday/ to see more inspiration from other months. 8. 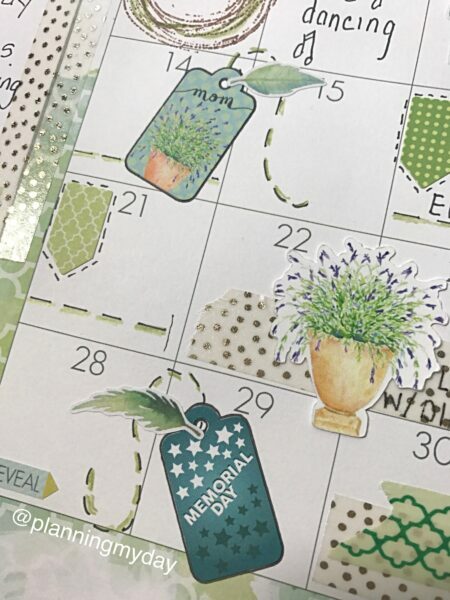 I use my favorite pieces of ephemera & stickers, to decorate larger open areas in my calendar month. Set’s of 3 adds dimension! 9. Finally I choose two cards to complement the overall layout as “Tip-ins“. 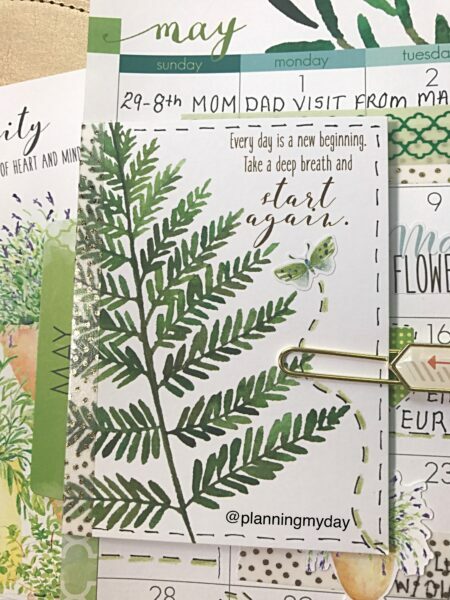 Here you’ll note I used the beautiful flower pot card and the fern leaf card! 10. I’ll then consider what I want my focus to be for each Tip-In, and decorate and fill them in accordingly! Taking the time every few months to look back through the year is a colorful walk down memory lane! Reminding me of the full-filling life I lead and keeping me focused on feeling humbled and blessed! 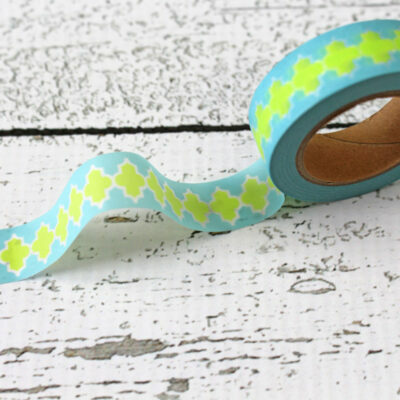 I hope you’ve enjoyed this months blog post my friends! As always I certainly enjoyed spending this time with each of you. I love to hear from you, so be sure to take a quick minute to say hello! 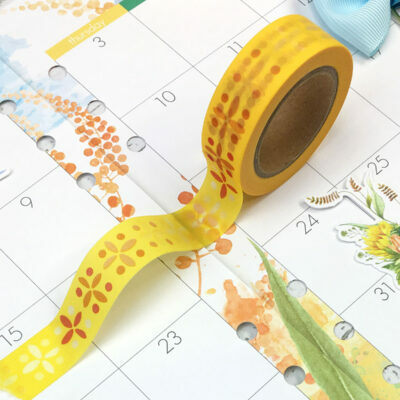 Oh, and please share some of your own decorating tips for your new month set up… learning from all of you is ALWAYS the highlight of my day!! Hugs and Blessings, where ever you are in the World! 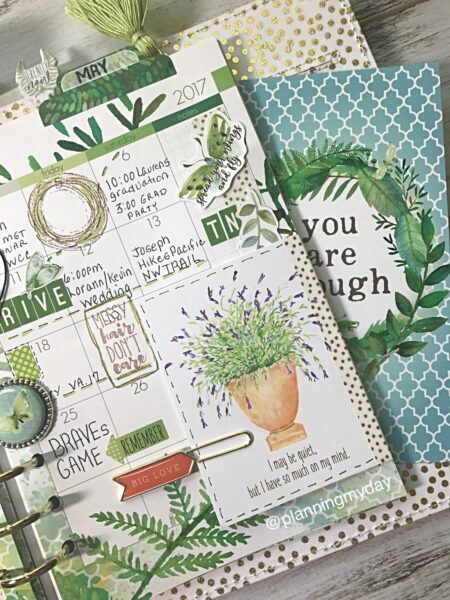 Laura, I really enjoyed how you broke down your monthly setup step-by-step. And yes, you are right, sometimes these easy things get so overwhelming and having a recipe truly helps. Thank you so much for sharing! simone! Your comments always make me smile girlfriend! you crack me up girl!! Kelley! You cracked me up with the “draw” NOT “eat” the birthday cake!! Me? I’m just a salad at the “salad bar” wishing I was a donut!! lol! Thank you for the kind comments, It’s fun to know I’ve inspired someone (hugs)….and I’m sure…what you already create is awesome!! love your ideas! Wondering where you got your binder? Hi Kari! thanks for the feedback my friend! The A-5 binder is from Hobby Lobby. DWCV I think? Laura, this was so fantastical! Great great great!